The London Saints Supporters Club were formed at an inaugural meeting held at the New Savoy Tavern, Savoy Street London WC2 on 2nd June 1978. We are officially recognised by Southampton FC. The majority of our members either live or work within the Greater London area and the Home Counties, but our membership expands to all parts of Great Britain as well as having members living as far afield as Denmark, Finland and Luxembourg. Over the years London Saints have held many evenings with the Management, Players and Staff of Southampton Football Club and we actively try and maintain this tradition. This has included question and answer evenings to post match occassions with the players. A few years ago we organised an excellent 'evening with the Ex-Saints' and had players coming along from five decades, including heroes from the FA Cup victory in 1976. Following our formation we began to participate in the APFSCIL sports leagues, and while we do not have an active football team, we have regular cricket fixtures as well s continuing to participate in the pool and darts leagues. We hold annual Christmas get-togethers to which all are invited. 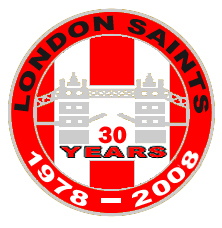 London Saints organise both Home and Away match tickets as well as train travel wherever possible. Membership costs have remained at a resonable rate throughout our existance and prospective members can easily join or find out more information by contacting any committee member under the contacts list. Finally, members are kept in touch with events by means of our bi-monthly newsletter 'Waterloo Sunset' now nearing its 150th edition, the London Saints website and email flashes.